The hover flies are a large group of generally beneficial insects. Their coloring and movements of most species mimic bees or wasps — boldly patterned with yellow, orange and black. Some species even go so far as to wave their front legs in front of their face to mimic the jointed antennae of the potter wasps. 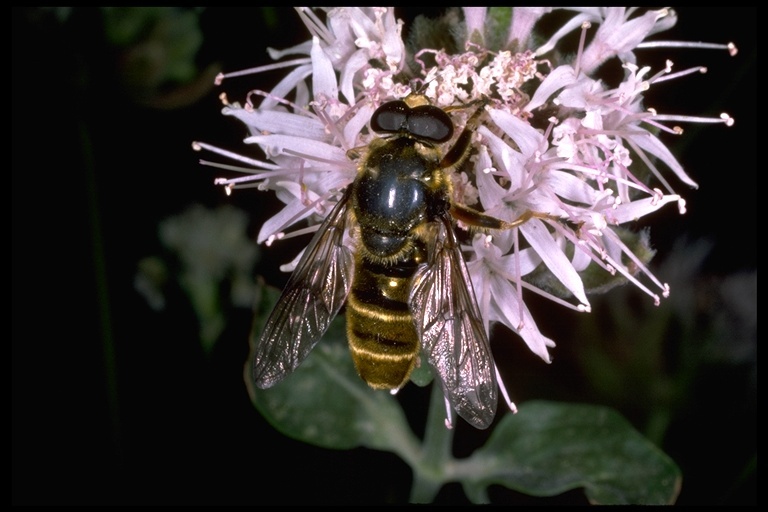 Adult hover flies can generally be found hovering in midair or feeding at flower blossoms. They eat only nectar and pollen. However, their larvae can be rapacious predators of aphids, thrips, and mites, or parasitic in the nests of ants or solitary bees. Still other larvae scavenge in soil or decaying plant material or eat living plants. Some are aquatic.